Unsurprisingly this Christmas I was showered with nail related gifts. Best. Day. Ever! I was kindly given a total of 12 new polishes and 2 nail pens, I knew there was a reason I'd stopped myself buying polishes this month! My brother and sister-in-law chose a gorgeous Nails Inc gift set with 6 polishes wrapped in individual little crackers. I would include a piccy but they only lasted about 3-4 minutes before I'd ripped open all the packaging to investigate, oops! It was so exciting to find out which polish was in each little sparkly wrapper. 1. Kings Road - a champagne-esque metallic polish from the Foil range. 2. Baker Street - what an amazing blue! Perfect for a colour pop with an all black outfit. 3. 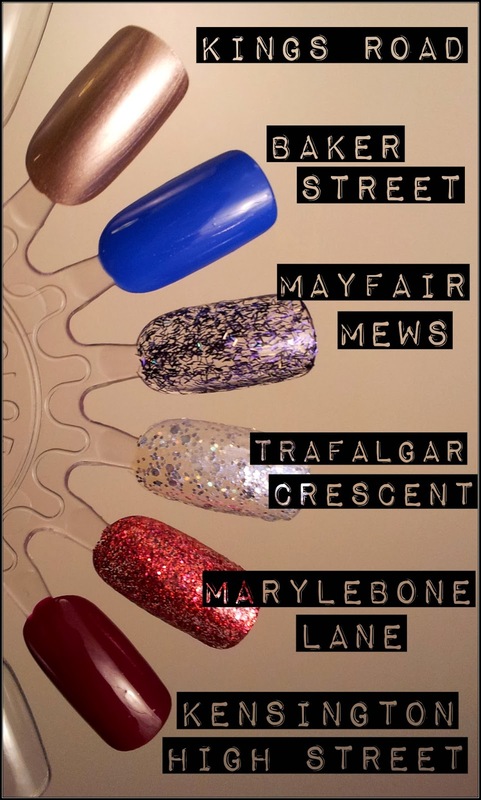 Mayfair Mews - a dark purple feather effect glitter polish from the Fibre Optic range. 4. Trafalgar Crescent - a silvery, iridescent, slightly holo polish from the Galaxy range. 5. 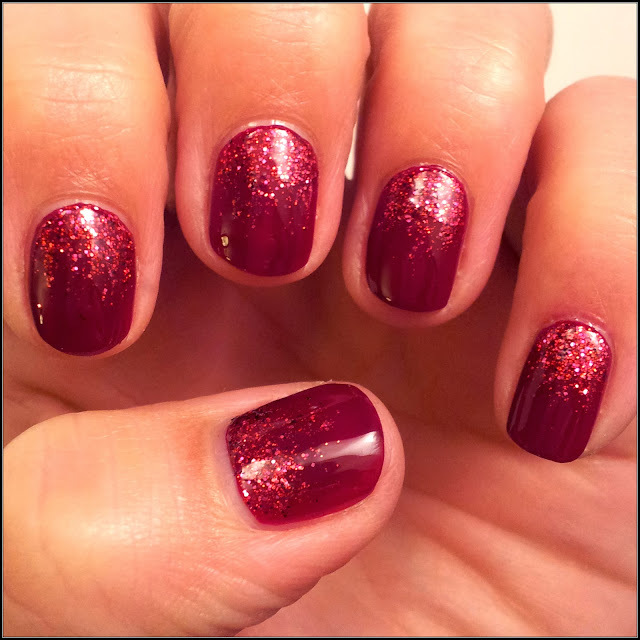 Marylebone Lane - a Special Effects dark red glitter with a hint of pink, yum! 6. Kensington High Street - somewhere between a dark burgundy and red wine, absolutely gorgeous! After all the novelty xmas nails I thought it was time to go for something a little more glamorous. So, for my first mani with my new Nails Inc's I chose to team Kensington High Street with Marylebone Lane. I couldn't resist a glitter fade, firstly because I was feeling a bit lazy, secondly because I love them!! I've been looking for the perfect silver glitter polish for a while, so can't wait to create something fun with Trafalgar Crescent, watch this space!